Among the ‘ashtavinayakas’ (8 Ganeshas) of Maharashtra, references of Lenyadri can be found in the ‘Ganesh Purana’ as a Jeernapur or Lekhanparvat. 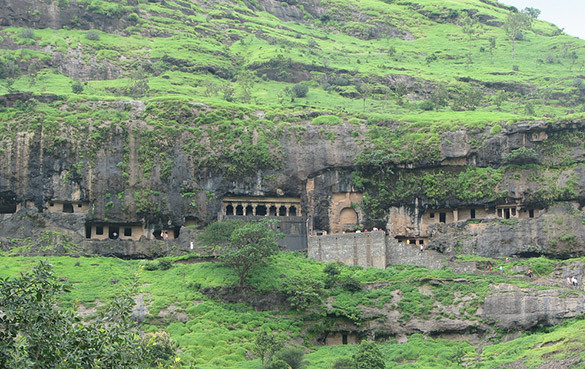 These are Buddhists caves carved out in the hills near Junnar. In one of these caves is an image Girijatmaj Ganesh which is very unique among all the ashtavinayakas since it has been carved out of the cave wall and can be seen from the rear only. According to a legend from the Puranas, Parvati, daughter of Himavana, desired Vinayaka to be her son. To fulfill this wish she rendered penance in the cave of Lenyadri for 12 years. During this time she created an image of Ganesh from clay and started worshipping it. Lord Ganesh was pleased and stood in front of Parvati in the form of a small child. The child had six hands, three eyes and a beautiful body. Further, this child, called Girijatmaj Ganesh, performed penance for a furthermore 12 years and it is said that in his childhood he defeated many demons and protected the ‘rishis’ from trouble. He also tamed Shesh, Yama and Indra at Lenyadri and stayed here for another 15 years before vanishing from the cave. To visit Lenyadri, located about 8 kilometers from Junnar, you have to climb 283 steps carved out of stone. The shrine here is nothing but a rock-cut cave at the entrance of which are eight pillars with carvings of elephants and lions. Next to these pillars is a big hall. In the south-facing cave there are 18 niches carved on the right side of the sanctum. Here, there is no separate image of Ganesh but a rock-cut image on one wall which is adorned with ‘sindoor’. Devotees can only see the back of Ganesh. Assuming that the face can be seen from the other side of the hill, there are some who have tried to traverse the hill. However, this is dangerous, especially because of the many honeycombs on the hill.